Have you ever been driving and the fuel light comes on? You know that your miles are limited, but you keep driving thinking you will make it to the next gas station you see. All of the sudden, you hear your car sputter and everything shuts down. It happened – you ran out of fuel. Some of us are busy and don’t think to refuel until it’s too late. 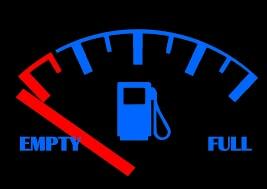 Others have an older car with a faulty fuel gauge. No matter why you run out of fuel, you should know that Roadside Services Towing of NWA offers fuel delivery service. If you find yourself on the side of the road or in a mall parking lot, give us a call. We will be glad to deliver fuel to your location and we will not leave until your car is back on the road. When you call us, be prepared to provide your location, the type of fuel you need (e.g., regular, premium, or diesel), and we will give you an estimate of our arrival time. We partner with local, national fuel stations in the area that provide high quality fuel so you don’t have to worry about what we are putting in your vehicle. If you are a AAA member, let us know that. We are a AAA approved towing contractor that can help you take advantage of your benefits. We understand that the experience of running out of fuel may be stressful. No one wants to walk to the nearest fueling station and beg to borrow a fuel container from the cashier. If you run out of fuel in an area of town that is unfamiliar to you, worrying about your safety and knowing where to go makes the situation more complicated. Additionally, it may be sweltering heat, pouring rain, dark, or late making this entire fiasco even more of a headache. Stay in your vehicle where it is safe, give us a call, and let us help. You will be glad you called us!